A correlation between variables does not automatically mean that the change in one variable is the cause of the change in the values of the other variable. Causation indicates that one event is the result of the occurrence of the other event; i.e. there is a causal relationship between the two events. First, correlation and causation both need an independent and dependent variable. An independent variable is a condition or piece of data in an experiment that can be controlled or changed. 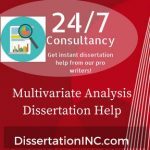 A dependent variable is a condition or piece of data in an experiment that is controlled or influenced by an external factor, most often the independent variable. Is there a relationship between a person's education level and their health? Is pet ownership associated with living longer? Did a company's marketing campaign increase their product sales? These and other questions are exploring whether a correlation exists between the two variables and if there is a correlation, then this may guide further research into investigating whether one action causes the other or not. By understanding correlation and causality, it allows for policies and programs that aim to bring about a desired outcome to be better targeted. Many studies are designed to test a correlation, but cannot possibly lead us to a causal conclusion; and yet, obvious “reasons” for the correlation abound, tempting us toward a potentially incorrect conclusion. People learn of a study showing that “girls who watch soap operas are more likely to have eating disorders”— a correlation between soap opera watching and eating disorders—but then they wrongly conclude that watching soap operas gives girls eating disorders. It is entirely possible that girls who are prone to eating disorders are also attracted to soap operas. There are several reasons why common sense conclusions about cause and effect might be wrong. Correlated occurrences may be due to a common cause. For example, the fact that red hair is correlated with blue eyes stems from a common genetic specification that codes for both. A correlation may also be observed when there is causality behind it. For example, it is well established that smoking cigarettes not only correlates with lung cancer but this actually causes it. However, in order to establish cause, we have to rule out the possibility that smokers are more likely to live in urban areas, where there is more pollution—and any other possible explanation for the observed correlation. The problem is that correlation is different from causation. Correlation is when two or more things or events tend to occur at about the same time and might be associated with each other, but aren't necessarily connected by a cause/effect relationship. For instance, in sick people, a runny nose and a sore throat correlate to each other--they tend to show up in the same patients. That doesn't mean runny noses cause sore throats, or that sore throats cause runny noses. However, forgetting that leads to sloppy thinking. Causation is often confused with correlation, which indicates the extent to which two variables tend to increase or decrease in parallel to each other. However, correlation by itself does not imply causation. There may be a third factor behind this; for example, if it is responsible for the fluctuations in both variables. A statistically significant correlation has been reported; for example, between yellow cars and a lower incidence of accidents. That does not indicate that yellow cars are safer, but just that fewer yellow cars are involved in accidents. A third factor, such as the personality type of the purchaser, is more likely to be responsible. Causation and Correlation are loosely used words in analytics. People tend to use these words interchangeably without knowing the fundamental difference between them. Apparently, people get trapped in the phonetics of these words and end up using them at wrong places. Let me warn you that apart from the similar sounding names, there isn’t a lot common in the two phenomena. Their fundamental implications are very different. There are obvious ethical limits to controlled studies: it would be problematic to take two comparable groups and make one smoke while denying cigarettes to the other in order to see if cigarette smoking really causes lung cancer. This is why epidemiological (or observational) studies are so important. These are studies in which large groups of people are followed over time, and their behavior and outcome is also observed. In these studies, it is extremely difficult (though sometimes still possible) to tease out cause and effect, against a mere correlation. Typically, one can only establish a causal relationship if the effects are extremely notable and there is no reasonable explanation that challenges causality. This was the case with cigarette smoking, for example. At the time that scientists, industry trade groups, activists and individuals were debating whether the observed correlation between heavy cigarette smoking and lung cancer was causal or not, many other hypotheses were considered (such as sleep deprivation or excessive drinking) and each one dismissed as insufficiently describing the data. It is now a widespread belief among scientists and doctors that smoking does indeed cause lung cancer. Causality is the area of statistics that is commonly misunderstood and misused by people in the mistaken belief that because the data shows a correlation, there is necessarily an underlying causal relationship . The use of a controlled study is the most effective way of establishing causality between variables. In a controlled study, the sample or population is split in two, with both groups being comparable in almost every way. The two groups then receive different treatments and the results of each group are assessed. For example, in medical research, one group may receive a placebo while the other group is given a new type of medication. If the two groups have noticeably different results, then the different experiences may have caused the different outcomes. Due to ethical reasons, there are limits to the use of controlled studies; it would not be appropriate to use two comparable groups and have one of them undergo a harmful activity while the other does not. To overcome this situation, observational studies are often used to investigate correlation and causation for the population of interest. The studies can look at the groups' behaviours and outcomes and then observe any changes over time. Causation goes a step further than correlation, stating that a change in the value of the x variable will cause a change in the value of the y variable. Too many times in research, in the media, or in the public consumption of statistical results, this leap is made when it shouldn’t be. For instance, you can’t claim that consumption of ice cream causes an increase in murder rates just because they are correlated. In fact, the study showed that temperature was positively correlated with both ice cream sales and murders. When can you make the causation leap? The most compelling case is when a well-designed experiment is conducted that rules out other factors that could be related to the outcomes. 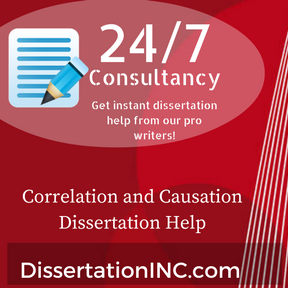 Our correlation versus causation Dissertation Help services, are extremely useful for the students, as we ensure . High quality service. 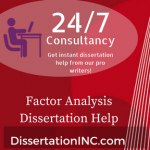 24 X 7 online support and assistance.Attractive presentation with diagrams, examples and charts. 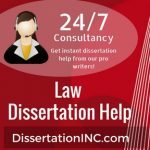 Unique and plagiarism free content. 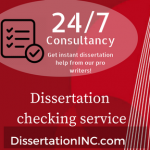 On time delivery of projects and dissertations, without failure. Our aim is to serve more students and hence, we always keep our prices low and affordable. Just upload your tasks to our systems today and we will get in touch with you right away.